Plastic-bag strips crocheted together with yarn create a unique tweed effect in this versatile tote. 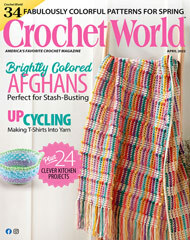 This e-pattern was originally published in the June 2011 issue of Crochet World magazine. Size: 14" x 13 1/2", excluding handles. Made with medium (worsted) weight yarn, strips cut from plastic shopping bags, and sizes G/6/4mm and L/11/8mm hooks.